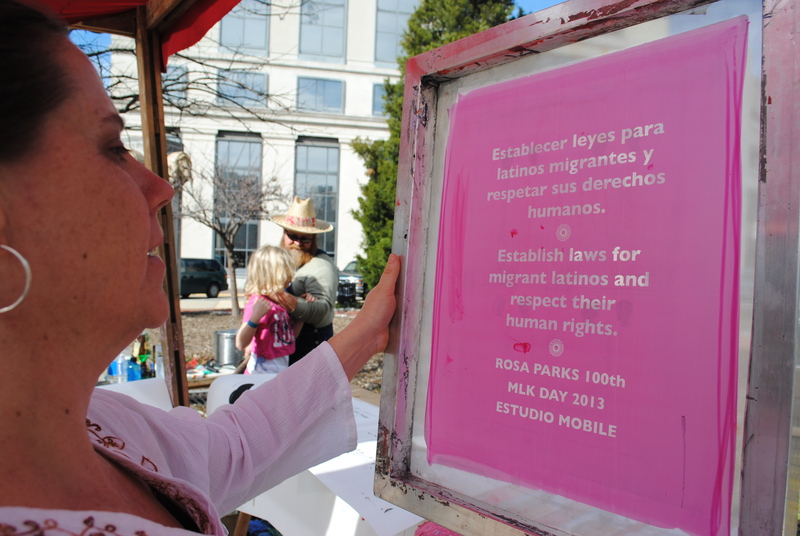 In honor of the occasion of Rosa Park’s 100th birthday celebration the Mobile Studio has developed a hands-on, participatory series of activities that will manifest the community wishes of the children of Montgomery Alabama through co-creative art making and civic engagement. 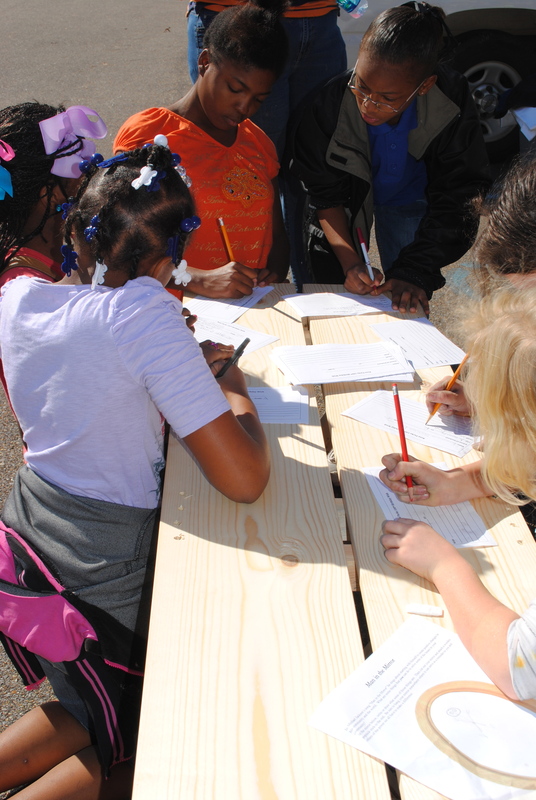 The children of Montgomery will be asked to reflect on Ms. Park’s vision for her city during her life time and write down their own vision and wishes for their city today. The visions of the children will be collected by the Rosa Parks Museum, the Mobile Studio will then choreograph a series of paper-making, graphic design, silk-screen printing, poster production, mapping and design proposals with the Rosa Parks Museum Ambassadors and the greater community. The Studio will guide this process so that the children’s wishes become both graphic messages and visions for community transformation that take inspiration from the past, add engagement in the present toward actions that will change the future for the benefit of all of Montgomery’s citizens. 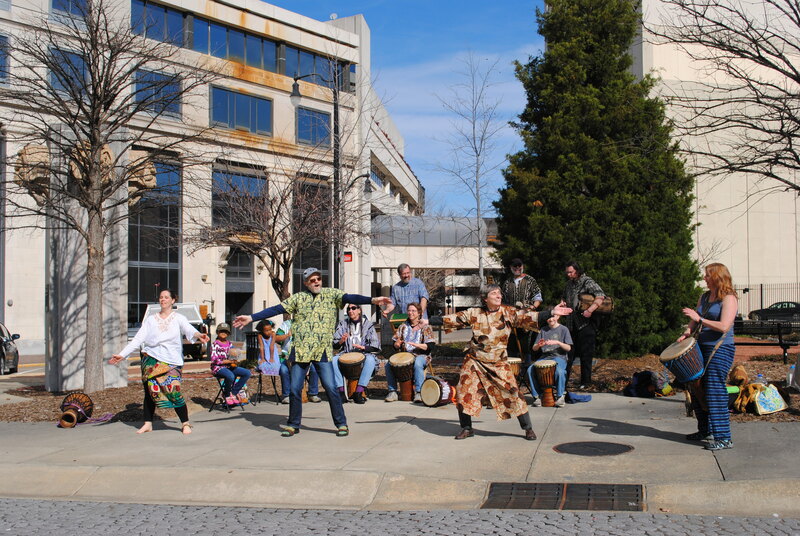 This birthday celebration is designed as more than a remembrance or even an event, it is an unfolding process of education and engagement with our sense of place designed to activate wishes inspired by Rosa Parks into the future. MOBILE STUDIO RECOGNIZED BY THE US SENATE! 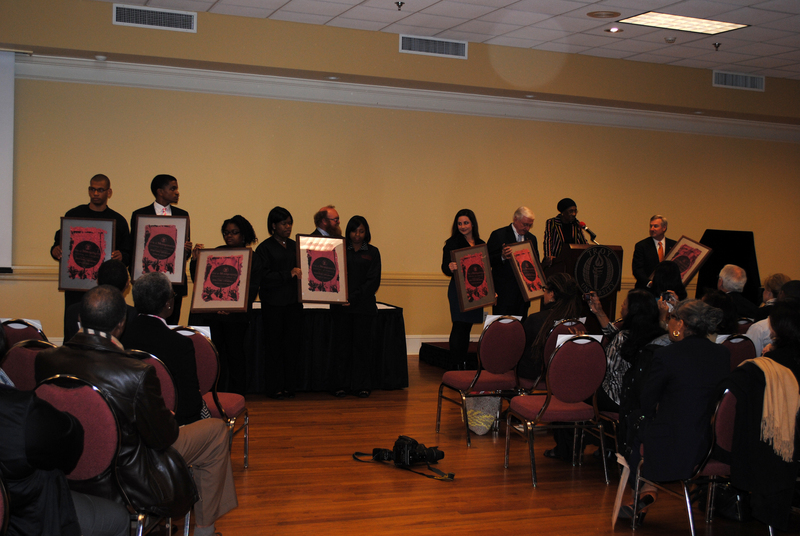 Rosa Parks Museum ambassadors present Wishes Do Come True Posters to the Mayor of Montgomery and the Chancellor of Troy University! Today, Mobile Studio was recognized by the U.S. Senate for our work with the Rosa Parks Museum honoring her 100th Birthday! Humongous shoutout to everyone who has believed in and participated in Mobile Studio thus far! 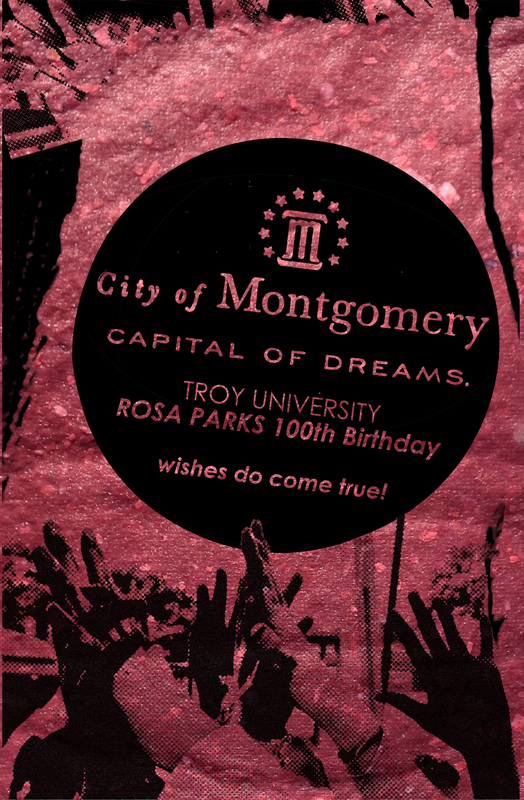 Whereas the Rosa Parks Museum at Troy University and the Mobile Studio will commemorate the birthday of Rosa Parks with the 100th Birthday Wishes Project, culminating on February 4, 2013, with a 100th birthday celebration at the Davis Theatre for the Performing Arts in Montgomery, Alabama, where 2,000 birthday wishes submitted by individuals throughout the United States will be transformed into 200 graphic messages: Now, therefore, be it Resolved, That the Senate–(1) observes the 100th birthday of civil rights icon Rosa Parks; and(2) commemorates the legacy of Rosa Parks to inspire all people of the United States to stand up for freedom and the principles of the Constitution. 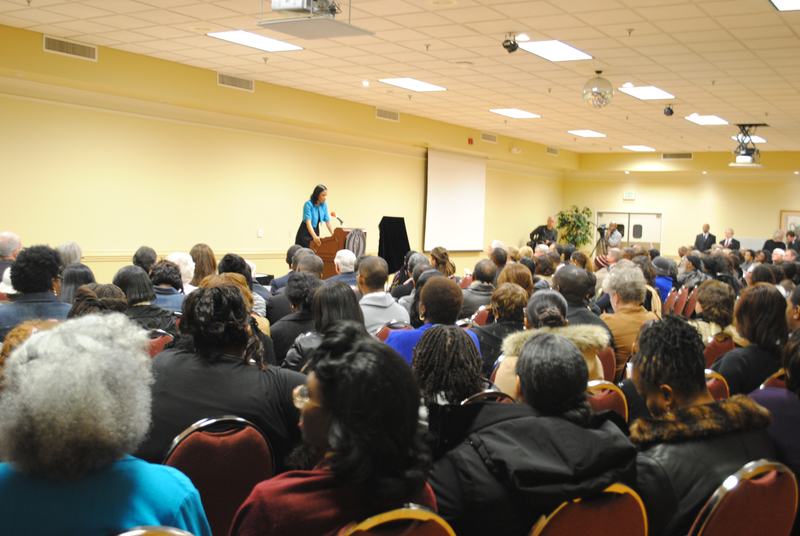 ROSA PARKS 100th BIRTHDAY GALA & NIGHT WITH ACCLAIMED POET NIKKY FINNEY! Mobile Studio is very excited to invite you to join us for these wonderful upcoming events which are part of our 13-month long celebration of Rosa Parks life works. As a community design partner, we are translating the wishes of Montgomery’s children for the future of their city inspired by Mrs. Parks, into actionable projects that will increase civic health for all. From these calls for safety, equity, courage, and hope to a new city of Freedom Parks and vital civic infrastructures, we have made this beautiful paper and are in the midst of printing posters that voice wishes as messages for the city. The posters will return to their districts, be presented to the city leadership, be mapped and designed into realizable projects extending Rosa Parks legacy into the future of Alabama’s City of Dreams. Troy University’s Rosa Parks Museum will celebrate Rosa Parks’ 100th birthday on Monday, February 4th, with an evening of art, poetry, and an official unveiling of the new Parks commemorative stamp by the U.S. Postal Service. The celebration event will be held at 6 p.m. inside the Gold Room on the second floor of Whitley Hall at Troy’s Montgomery Campus. Admission is free and open to the public. • National Book Award-winning poet Nikky Finney will read her poem “Red Velvet,” which is about Rosa Parks. • Dr. Riche’ Richardson, an associate professor at the Africana Studies and Research Center at Cornell University, will present a lecture entitled “Rosa Parks at 100.” A native of Montgomery, Richardson’s essays have been published in numerous journals such as “American Literature” and “Mississippi Quarterly.” Her first book was “Black Masculinity and the U.S. South: From Uncle Tom to Gangsta,” and she has a book in progress exploring black femininity in the South. • Museum Director Georgette Norman and Curator Daniel Neil will present the “Rosa Parks 100th Birthday Wishes Project.” For several months, the museum has collected more than 1,400 “wishes” for the future of the city and nation inspired by Parks’ life work from local students and other individuals. Many of these “wishes” have been turned into a series of silk screen posters, which will be presented to local elected officials and leaders for display around Montgomery. • Bridgett Carol, Director of Marketing for the U.S. 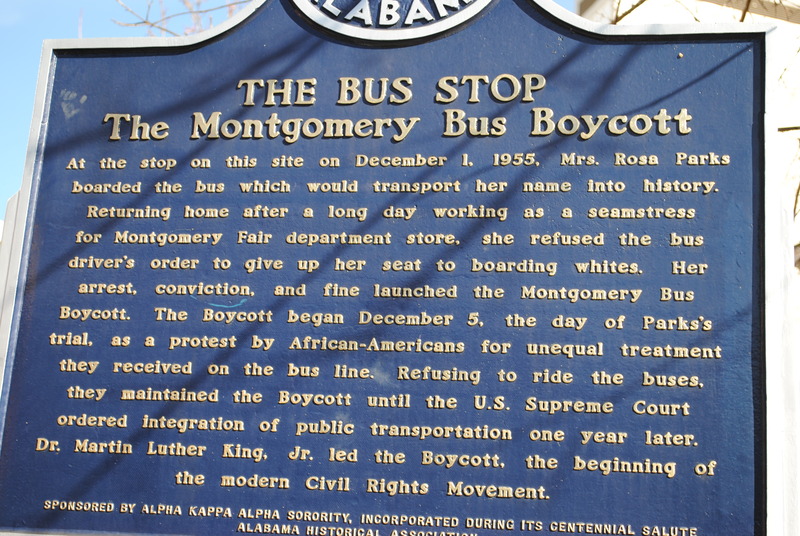 Postal Service Alabama District and Donnie Snipes, Postmaster for Montgomery, will unveil the new Rosa Parks commemorative stamp, one of several unveilings happening nationwide this day. For more information about this or other museum events, contact Museum Director Georgette Norman at (334) 241-8608, or gmnorman@troy.edu. 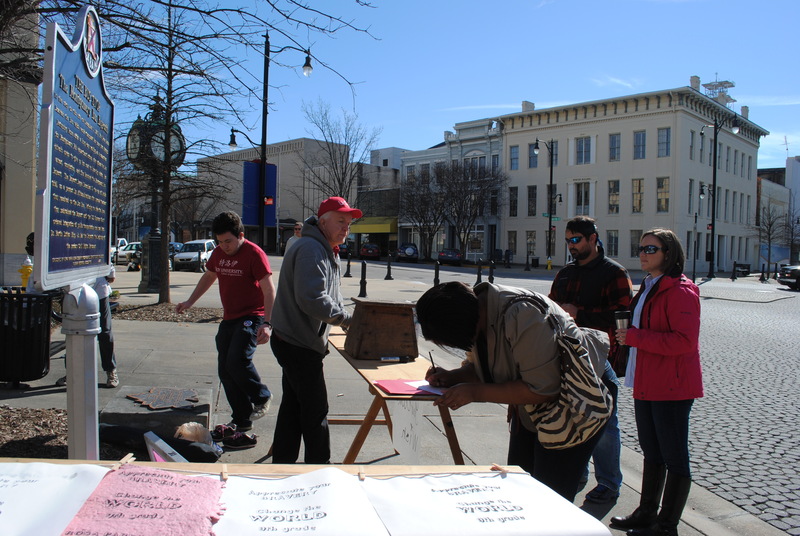 TENS OF PEOPLE GATHER FOR ROSA PARKS 100TH BIRTHDAY WISHES PRINTING! 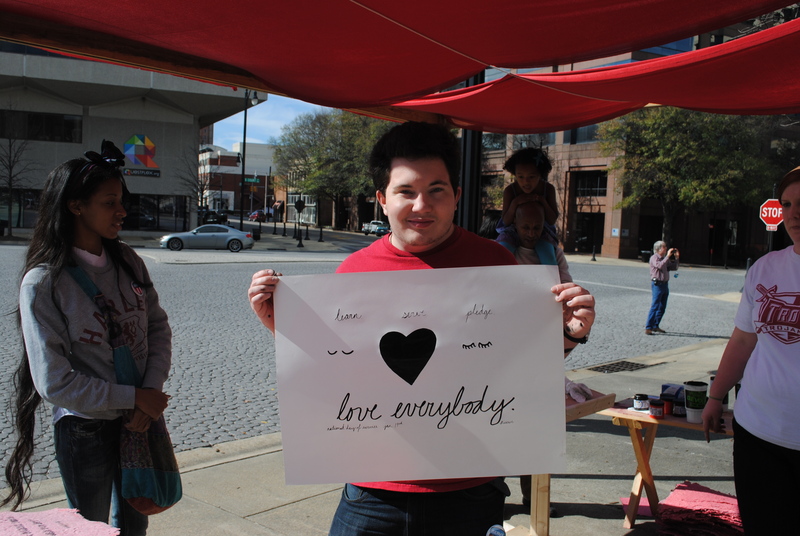 With hundreds gathered for a 2nd Amendment Right rally at the Capital and a NFL event in town, Mobile Studio celebrated MLK’s National Day of Service by printing wishes of students from across Montgomery, Alabama, inspired by the life works of Rosa Parks. 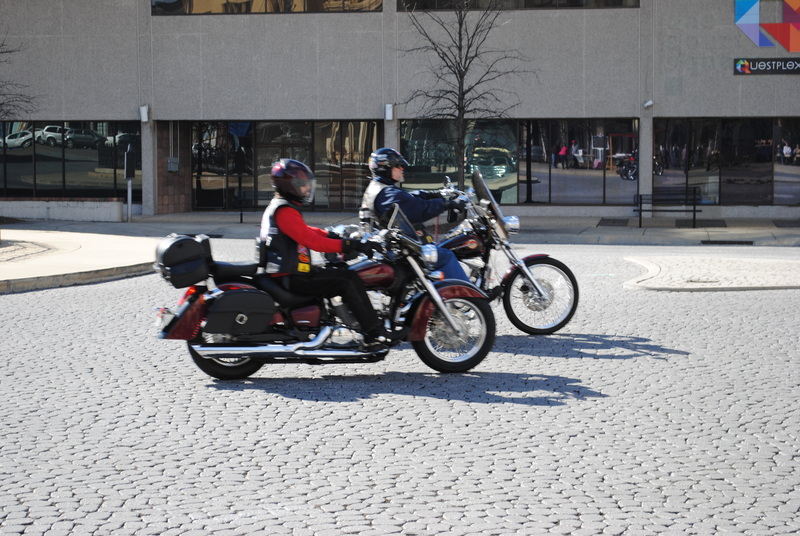 We have received nearly 1,500 from every district in the city and from as far away as Paris and Burundi. The wishes have been translated to graphic posters- printed messages that speak directly to the future of the city. Ranging from stop the violence and the killing! to appreciate your bravery and change the world!, the voices of the children are a clarion call to urban action. Not renewal but regenerative design, from soil to civic health, from the roots to the shoots- what is needed includes sidewalks, parks and bike lanes, community centers and excellent public transportation, investment in education and the future of all children today. 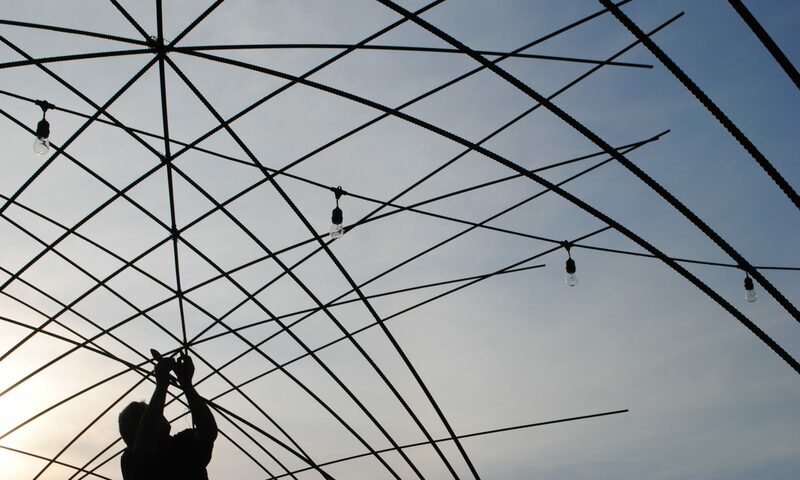 To make the wishes of these children come true in the City of Dreams, citizens and civic leaders will need to collaborate to rebuild vital community and neighborhood infrastructures. 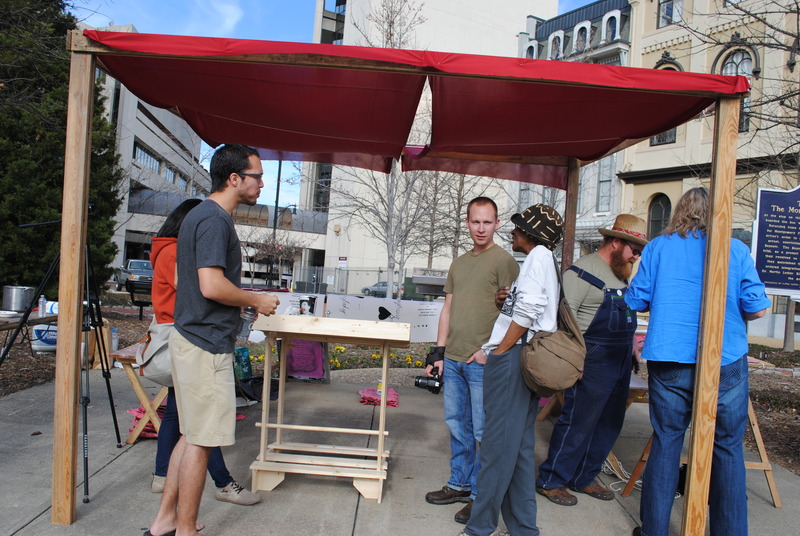 Enter the Mobile Studio, a collective art-based approach to open dialogue about our shared landscapes. We aim to engage the discourse, share the visions and bring the change. 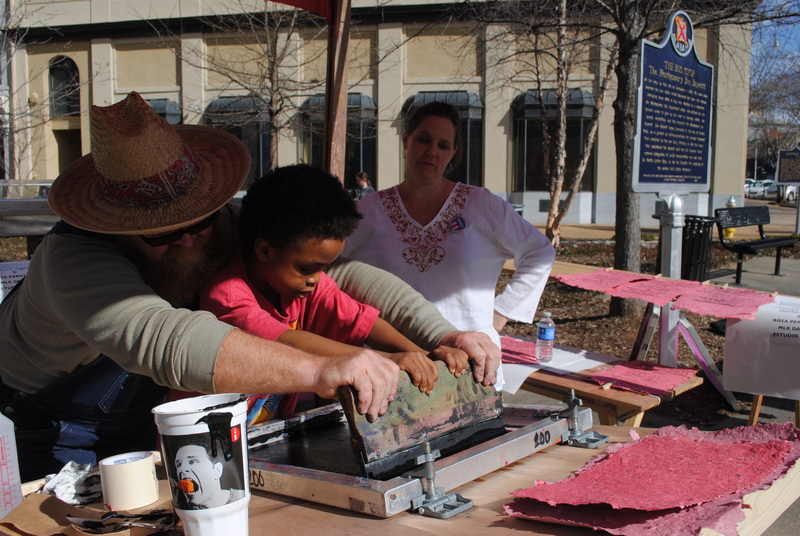 The public silk screening day was held beside the bus stop at which Rosa waited in 1955, in Montgomery’s historic Court Square, a fitting place from which to consider the past, present, and future of downtown Montgomery. 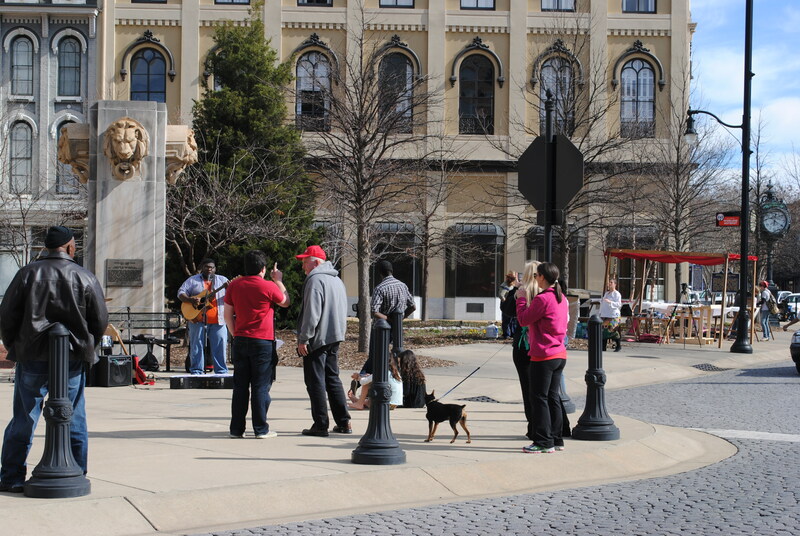 Court Square was one of the largest slave markets of the Confederacy. In that clearing beside the first courthouse, an artesian spring provided water to the emerging capital, as cotton and hay was sold and slaves auctioned at the block. In 1965, a decade after Mrs. Parks acted for equal rights and justice, thousands of people marched from Selma to the steps of the Capital along Dexter Avenue past the Dexter Street Baptist Church and continue to march today to actualize human rights and justice. However, today, this ground zero is more of a ghost space despite its prominent neighbors. Downtown is half boarded up. Setting the print shop here for this civic workshop was an intentional alignment, a strategic punctum in the studium of the city. With the Potluck Drumming Choir and Auburn Alabama’s own Less Than Heroes, the field day served to test the acupunctural significance of that haunted terrain in the revitalizing of Montgomery’s civic health and to stimulate the tingling of healing, opening pathways, and channels of sustained service and exchange. 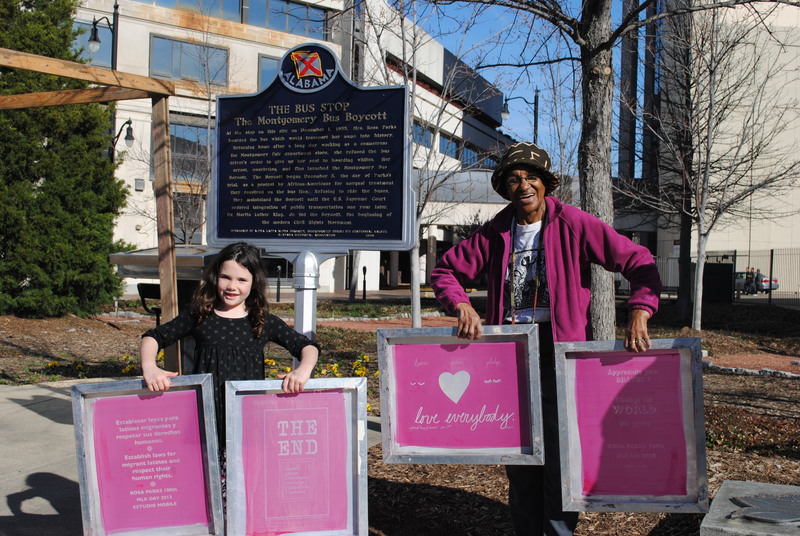 Printing these powerful wishes at the epicenter of Dexter Avenue, Rosa Parks Avenue and the State Capital grounds, on what was probably once a sacred mound above the Alabama River, was for the studio, a double move of resistance and wish-making. The posters give power and presence to the children’s wishes for peace, safety, equality, and justice. The event itself celebrates that act, and invites an open dialogue about how we achieve these wishes. This project is ongoing. We hope you will join us in this wonderful partnership between Troy University’s Rosa Parks Museum, Professor Jerry Johnson and his graphic design program at Troy, Auburn University’s Master of Landscape Architecture Program and an international group of students and artists dedicated to the critical and creative practice of being the change we wish to see in the world. Poet Nikki Finney http://nikkyfinney.net/ will be speaking at the commemoration of what would be Rosa Parks 100th Birthday the week of February 4th and prints by Amos Kennedy are showing at the Rosa Parks Museum Gallery http://trojan.troy.edu/community/rosa-parks-museum/. Mobile Studio is excited to be a part of this wonderful year-long project! 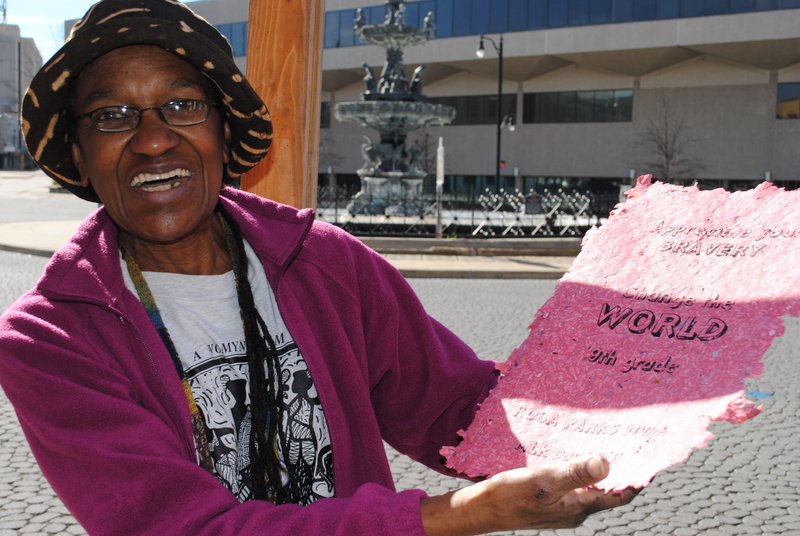 SILKSCREEN ROSA PARKS BIRTHDAY WISHES SATURDAY JAN 19th MONTGOMERY’S COURT SQUARE: C’MON! 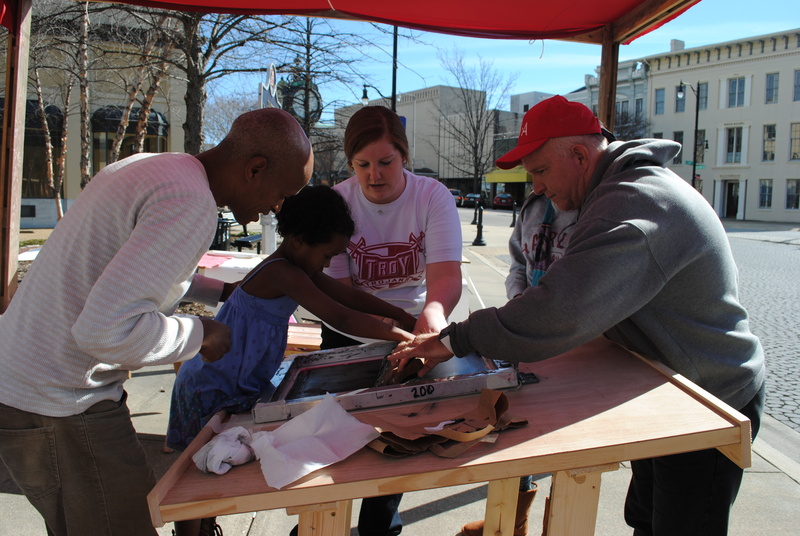 Please join us next Saturday at Montgomery’s Court Square to silkscreen the first set of wishes posters for Rosa Parks’ 100th Birthday. More than 2000 wishes for the future of the city inspired by Ms. Parks’ life work have poured in from school children across the city and around the world. 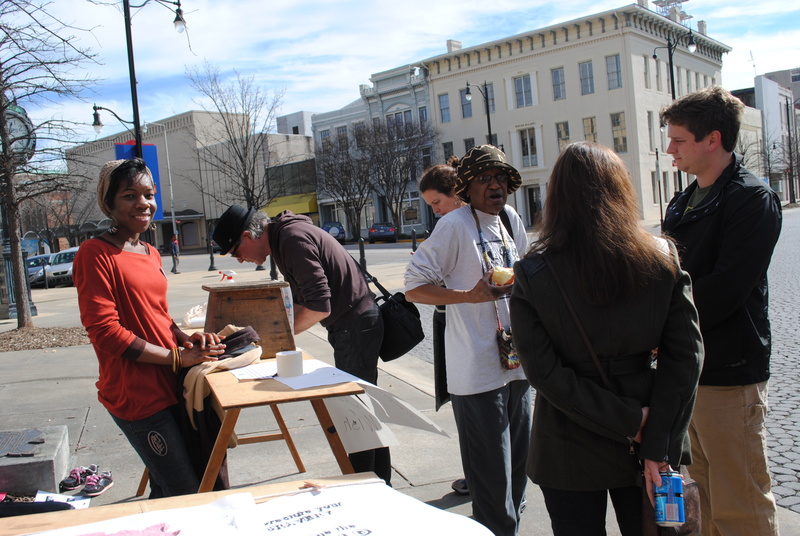 The Mobile Studio has worked with Ambassadors of the Rosa Parks Museum, Jerry Johnson and his graphic design students at Troy University and Landscape Architecture students from Auburn University to translate these wishes into visual messages that will be returned to schools and neighborhoods across the city and presented to district representatives on the evening of Rosa Parks’ Birthday Gala. The day long event will bring the art of silkscreening and the populist tradition of the broadside print to the center of the city, free and fun for all. Bring the family, bring the students, citizens one and all and spend the day in this intriguing urban terrain making art, music, food together to re-new our collective commitment to justice, to equal access to the civic infrastructures and civic health of the the city. 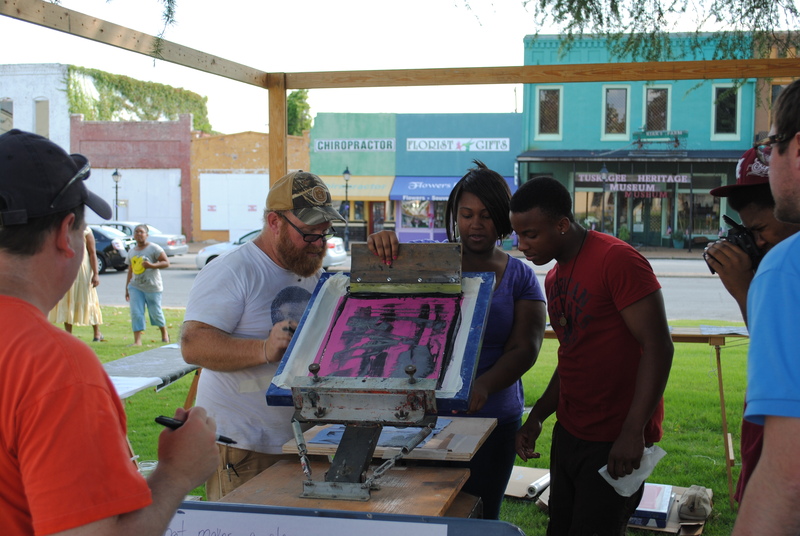 The photograph above is from a Mobile Studio silk screen event last spring at Tuskegee’s Courthouse Square with Mark Wilson’s team of outstanding students from across Macon County and Auburn’s Community and Civic Engagement Program. Next Saturday promises the beautiful handmade Rose Paper, the silky scarlet studio fabric roof and much more. Hope to see you there! WE INVITE ARTISTS AROUND THE WORLD TO SUBMIT 11×17 POSTERS THAT EXPRESS THEIR WISH FOR CHANGE INSPIRED BY THE LIFE WORKS OF ROSA PARKS ON THE OCCASION OF HER 100TH BIRTHDAY. THE SERIES, ALONG WITH 100 LOCAL MONTGOMERY VOICES WILL BECOME PART OF A TRAVELING EXHIBITION DREAMED BY THE ROSA PARKS MUSEUM IN MONTGOMERY ALABAMA AND THE MOBILE STUDIO. To submit your own wishes to the Rosa Parks 100 Wishes project simply print out this form and mail it to the Rosa Parks Museum 231 Montgomery Street Montgomery, AL 36104. 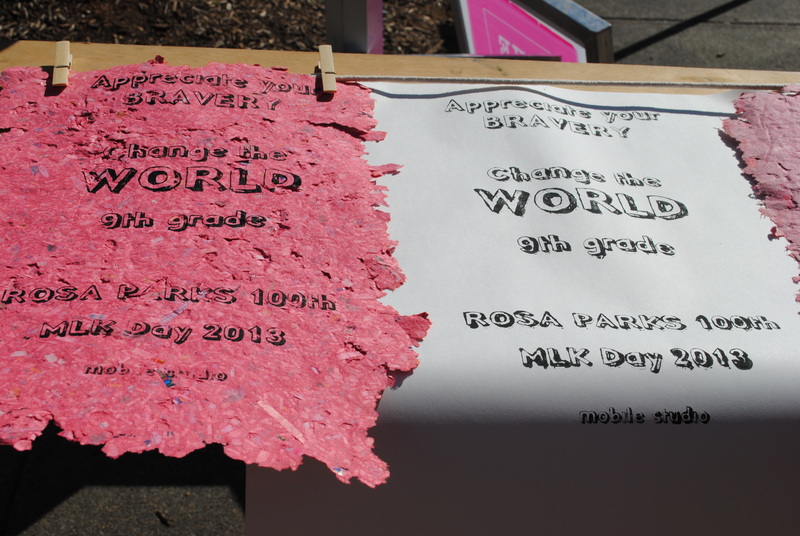 Paper Making for Rosa Parks 100th Birthday! 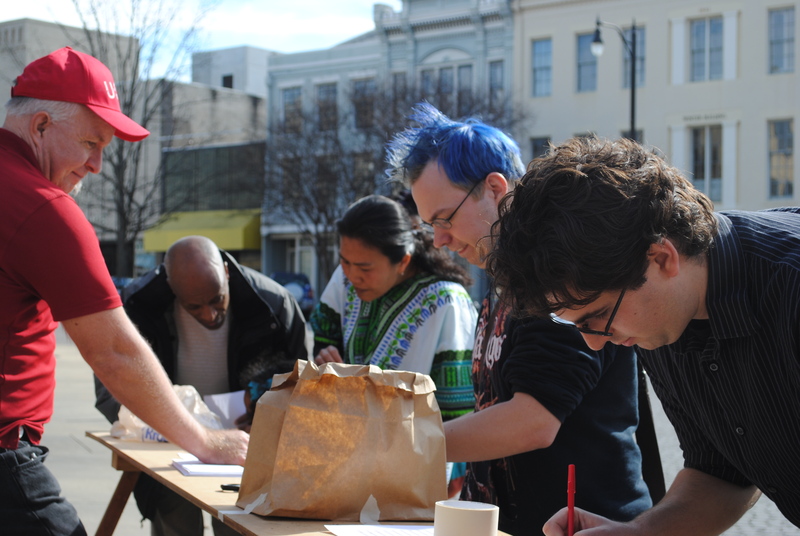 The scarlet paper-making pavillion became a crossroads of hands-on civic engagement, as wishes inspired by Rosa Parks life works were drafted and handmade paper was created for the posters that will broadcast these wishes as messages, as art across the neighborhoods of Montgomery in honor of her upcoming 100th birthday.